HD 2303 Anemometer. Air Velocity Meter. measuring range -200°C +650°C. Storage of maximum, minimum, average value. The HD2303.0 is a portable instrument with a large LCD display. It is designed for use in the fields of air conditioning, heating, ventilation and environmental comfort. It uses hot-wire or vane probes to measure air speed, flow rate, and temperature inside pipelines and vents. 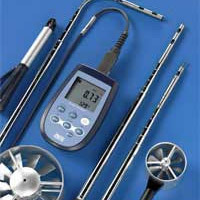 Temperature only is measured by immersion,penetration or air contact probes. The temperature sensor used can be chosenfrom the Pt100, Pt1000. The probes are fitted with the SICRAM module, with the factory calibration settings already being memorized inside. The Max, Min and Avg function calculate the maximum, minimum or average values. Other functions include: the relative measurement REL, the HOLD function, and the automatic turning off that can also be disabled. case. The probes must be ordered separately. AP471 S1: Hot-wire telescopic probe, measuring range: 0 - 40m/s. Cable length 2 metres. AP471 S2: Omni directional hot-wire probe, measuring range: 0 - 5m/s. Cable length 2 metres. AP471 S3: Hot-wire telescopic probe with terminal tip for easy position, measuring range: 0 - 40m/s. AP471 S4: Omni directional hot-wire telescopic probe with base, measuring range: 0 - 5m/s. AP471 S5: Omni directional hot-wire telescopic probe, measuring range: 0 - 5m/s. AP472 S1L: Vane probe with thermocouple, Φ 100mm. Speed from 0.6 to 20m/s. Temperature from -25 to 80°C. Cable length 2 metres. AP472 S1H: Vane probe with thermocouple, Φ 100mm speed from 10 to 30m/s. AP472 S2: Vane probe, Φ 60mm. Measurement range: 0.25 - 20m/s. Cable length 2 metres. AP472 S4L: Vane probe, Φ 16mm. speed from 0.6 to 20m/s. Cable length 2 metres. AP472 S4LT: Vane probe with thermocouple, Φ 16mm, speed from 0.6 to 20m/s. Temperature from -30 to 120°C with thermocouple K sensor(*). Cable length 2 metres. AP472 S4H: Vane probe, Φ 16mm speed from 10 to 50m/s. Cable length 2 metres. AP472 S4HT: Vane probe with thermocouple, Φ 16mm speed from 10 to 50m/s. TP472I: Immersion probe, Pt100 sensor. Stem Φ 3 mm, length 300 mm. Cable length 2 metres. TP472I.0: Immersion probe, Pt100 sensor. Stem Φ 3 mm, length 230 mm. Cable length 2 metres. TP473P.0: Penetration probe, Pt100 sensor. Stem Φ 4mm, length 150 mm. Cable length 2 metres. TP474C.0: Contact probe, Pt100 sensor. Stem Φ 4mm, length 230mm, contact surface Φ 5mm. TP475A.0: Air probe, Pt100 sensor. Stem Φ 4mm, length 230mm. Cable length 2 metres. TP472I.5: Immersion probe, Pt100 sensor. Stem Φ 6mm, length 500 mm. Cable length 2 metres. TP472I.10: Immersion probe, Pt100 sensor. Stem Φ 6mm, length 1000mm. Cable length 2 metres. TP47.100: 4 wire direct Pt100 sensor immersion probe,. Probes stem Φ 3mm, length 230mm. Connection cable 4 wires with connector, length 2 metres. TP47.1000: Pt1000 sensor immersion probe. Probes stem Φ 3mm, length 230mm. Connection cable 2 wires with connector, length 2 metres. TP47: Only connector for probe connection: direct 4 wires Pt100 and 2 wires Pt1000.